and ”KISS Army” – The Coolest Band In The World – will be performing a live ”KISS” concert! KISS lead guitarist Tommy Thayer! 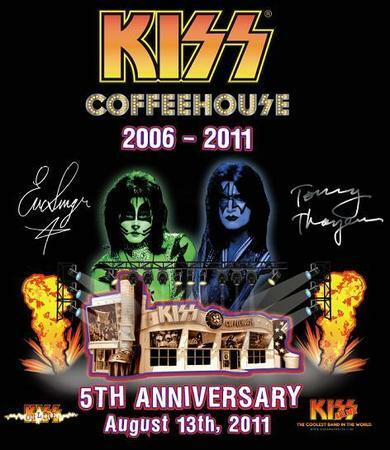 This is a very rare, and unique opportunity to meet both Eric & Tommy, together for the first time at the KISS Coffeehouse, to talk to, to take photos with, and to sign autographs, as well as to take part in an intimate Q&A session. Again, together for the first time at the KISS Coffeehouse! All professional, high-resolution photographs taken with Eric & Tommy will be e-mailed to all fans purchasing either the Platinum or Double Platinum package within 1-2 weeks of the event. This will be our LAST Anniversary Party for the next 5 years! This very special, and historic event is sure to sell out quickly! Tickets are limited, so if you want to be a part of ”KISSTORY” and celebrate this very special and historic milestone, purchase your tickets today! Tickets are available online ONLY on the KISS Coffeehouse website.